Thailand’s Phuket island has its fair share of Peranakan families. Here’s a culture test for us Malaysians: how much do we really know about Baba Nyonya culture, besides dishes like laksa, otak-otak and the kebaya? The answer is probably “very little”. Malaysians only know that Baba Nyonya culture originated in Penang, Malacca and Singapore. Chinese immigrants married local Malays, worked closely with the British and gave birth to a new upper class in society. But their influence has waned since independence. 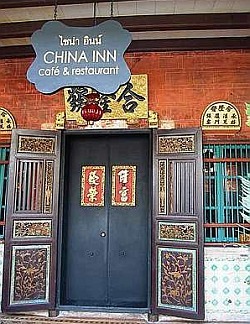 The Peranakan influence is still strong in Phuket town, especially in Talang Street. The 19th Peranakan Convention in Phuket recently proved that the community has links outside of Malaysia and Singapore. The resort island has long been linked with the Peranakans (common term for Baba Nyonya descendants). “Growing up, we always knew there was a Peranakan community in Phuket, but we didn’t quite know their exact [cultural] identity,” explains Khoo Salma Nasution, a Penang-based Peranakan. Thailand’s largest island claims a fair share of Peranakan families due to a strong affiliation with Penang. Thanks to the the steam ship and demand for raw materials between colonies during British Rule, island states were never out of touch. The Peranakans, became willing merchants and immensely wealthy in the process. The decline in Peranakan influence has since made the various clans all the more protective of their heritage. Regardless of where they are from, the Baba Peranakan conventions are celebrations of their identity. The recent weekend-long convention was literally a colourful affair, with batik attire in full force from the men, while women wore their kebayas. Amid the revelry and delicious food, all were gathered for the important question: what could they do to preserve their unique culture? Chan Eng Tai, from the Peranakan Association Singapore gave a humorous demonstration of how Babas and Nyonyas could maintain their customs. One way was to perform the sojah – the Peranakan form of Chinese New Year filial greeting. 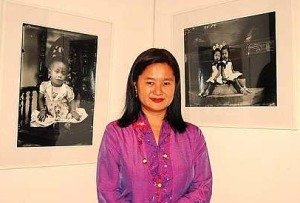 Penang-based publisher and Peranakan herself, Khoo Salma Nasution stands in front of a Peranakan photo exhibit. Describing the way to greet a grandmother, Chan quipped: “If she’s giving lots of money, you can kui (bow on hands and knees) but if she’s only going to give a little bit then you just stand-lah.” Author and English associate professor Dr Lee Siew Kim noted that food also played an important role in preserving the culture. Khoo also presented a seminar on the history and heritage of Peranakans in Phuket, touching on the uniqueness of Peranakan architecture. Driving past Talang Street in Phuket town, you’d think we were in Malacca’s Jonker Street or old parts of Georgetown with its Peranakan shop facades. It was as if time had stopped. A famous mansion we toured the following day – Chinpracha House – displayed perfectly preserved antiquities of old Phuket Baba culture. In an effort to keep the Phuket Baba identity alive, the Phuket City Municipality had ensured the preservation of old building. Thanks to the convention, ties were cemented between the Baba Nyonya communities. It was a display of closeness that other communities could rarely match. Is it Baba Nyonya, Peranakan or Straits Chinese? These are the various terms used to classify early Chinese immigrants to South-East Asia who married into the ethnic local community and adopted their customs. This refers to the Baba Nyonya community living in the Straits Settlements from 1826 till the end of World War II. They used this term to distinguish themselves from the Peranakan Community in Malacca. Baba refers to a male descendant while Nyonya (sometimes called Nonya) describes the female descendant. This originally referred to the descendants of the Baba and Nyonya themselves. The term was more widely used in Indonesia but was later adopted by the Straits Chinese when the Straits Settlements was dissolved by the British. Because the word “nyonya” is unpronounceable in the Thai tongue, various terms like Baba and Yaya were used until the more acceptable term Phuket Baba was adopted.